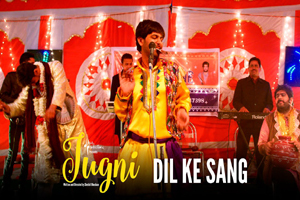 A playful song sung by Nakash Aziz starring Sugandha Garg, Siddhant Behl. Star Cast: Sugandha Garg, Siddhant Behl, Anurita Jha, Sadhana Singh, Samir Sharma, Chandan Gill, Kartick Sitaraman. The video of this song is available on YouTube at the official channel Sony Music India. This video is of 2 minutes 37 seconds duration. Lyrics of "Dil Ke Sang"
Lyrics in Hindi (Unicode) of "दिल के संग"